A discussion about interesting and hopefully unique to you herbaceous perennials that will be available at the 2015 HAS Plant Sale. Things covered include deer-resistance, water needs and exposure. 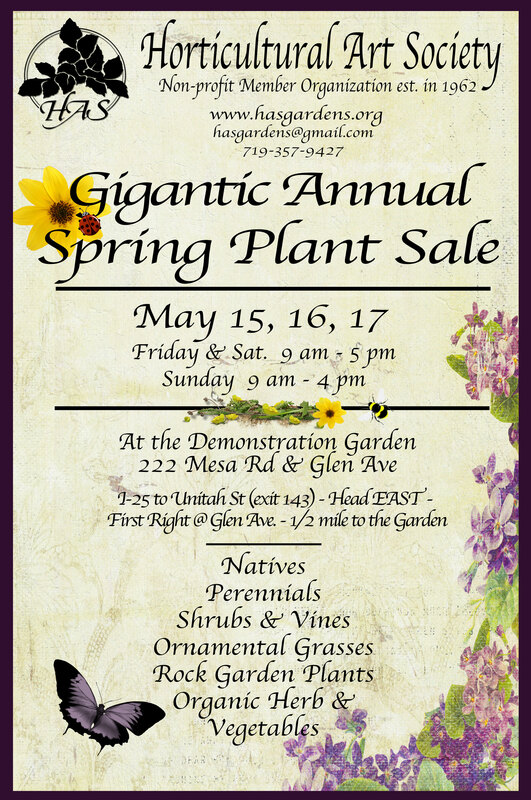 HAS Annual Plant Sale is May 15, 16, & 17. Allen is a native of Colorado Springs and has been active in the green industry for the last 10 years, working at a local wholesale nursery specializing in growing perennials, ground covers and ornamental grasses. In the pursuit of expanding his knowledge, he became and has been an active Colorado Master Gardener volunteer since 2007. In 2013, he became a Colorado Certified Nursery Professional, a Colorado green industry certification. He has been a member of HAS since 2012 and has been on the HAS Board since 2013. This entry was posted in Uncategorized and tagged cactus, colorado gardening, colorado native plants, colorado springs gardening, colorado springs plant sale, Colorado Technical University, CTU, Demonstration Garden sale, HAS library lecture, has plant sale, horticultural art society by Horticultural Art Society (H.A.S.). Bookmark the permalink.